Two CAMD alumnae, who earned their Master of Fine Arts (MFA) in Information Design and Visualization, were recently recognized by the Kantar Information is Beautiful Awards, which celebrate excellence and beauty in data visualizations, infographics, interactives, and information art. Skye Moret ’16 was awarded Silver for a project, entitled One Angry Bird, that she completed at Periscopic, where she works as a Data Visualizer. Irene de la Torre Arenas ’17 also won Silver, for her Northeastern thesis entitled Swimming World Records throughout History. Established in 2012, the Kantar Information is Beautiful Awards are judged not only by a panel of experts but also through a public vote of more than 300,000 members, so being recognized is an impressive accomplishment. The project, One Angry Bird, examines the facial expressions of the last six United States presidents during the past 10 inaugurations, where leaders have the chance to “set the presidential tone, inspire a country, put an election to rest, and look to the future.” As the research portrayed, the various expressions that were examined revealed differences in both the moods and emotions they conveyed. The trends concluded that five of the past six presidents were either positive or measured during their speeches, which is a contrast to the negative facial expressions found throughout President Trump’s inaugural remarks in January of 2017. “It is rare to be able to adapt typical charts we see everyday (i.e. bar graphs) in a way that is compelling and intuitive,” Skye continued. She hopes to see more and more CAMD Information Design and Visualization graduates winning awards and defining the creative dialogue and direction of the field – so it is no surprise she was thrilled to learn that her peer, Irene de la Torre Arenas, was also a recipient of a Kantar Information is Beautiful Award.Irene’s project explored how much swimmers’ performance has improved since the beginning of the 20th Century. 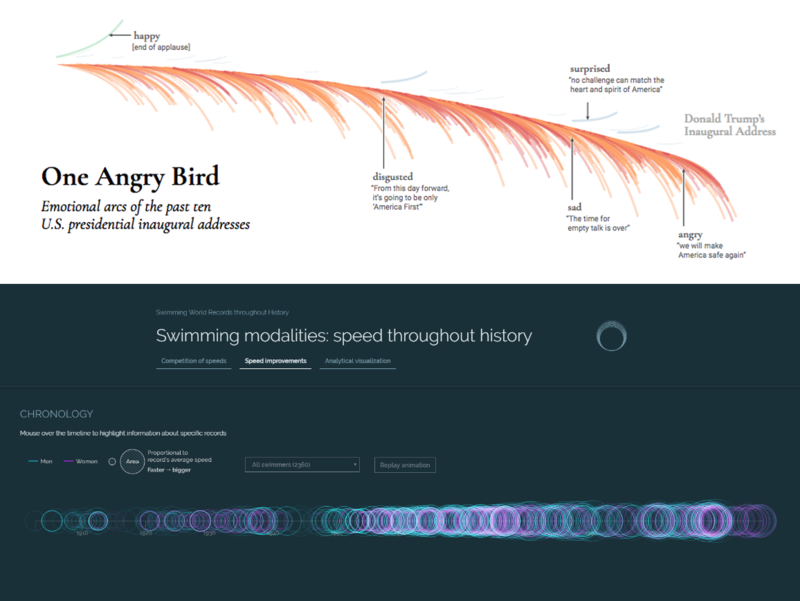 According to the project’s summary, it includes three different visualizations: the first one focuses in the average speeds of the records per event or modality, the second one analyzes those speeds centering the attention on the swimmers, and the last one provides information about range of times and nationality of the swimmers. Since thesis projects are so intense, Irene describes this recognition as an incredible reward to the long and hard process. Text: Molly Chase, originally published on the CAMD blog.